Tick-tock, tick-tock goes the OPEC clock. And make no mistake; higher oil prices are coming. All the ducks are in a row, and they’re being knocked out one by one. And the biggest catalysts for a crude spike this summer are all connected to OPEC. We’ve been following the collapse of Venezuela’s oil industry for years, and it won’t take much more for the entire house of cards to topple. We’re even at the point that Russia has put boots on the ground to ensure the interest payments it’s owed (which are being paid in barrels) continue flowing. But it was the latest action in Libya that gave us a fresh perspective on how vulnerable OPEC’s oil supply truly is. A few days ago, one of Libya’s warlords, Khalifa Haftar, marched his troops into Tripoli. He’s already seized critical oil fields like the Al-Fil field, which produces over 70,000 barrels per day. What’s interesting here is the quality of crude that Libya produces. Libyan oil is of the light, sweet variety that drillers in West Texas extract. Some of you might recall that when Libya’s civil war broke out years ago, the Saudis calmed the international community and insisted that they would make up for any supply shortfalls. Unfortunately, we soon learned that Saudi Arabia’s spare capacity wasn’t exactly the same quality refiners were used to, but rather a heavier grade that those refineries couldn’t handle. I won’t pretend to know how this will play out. Nobody knows, especially the three governments in Tripoli claiming authority. What I can tell you is that the world may soon be scrambling to find light, sweet oil. So what’s the smart money doing? There’s really only one place to go right now. Regarding U.S. oil exports, it shouldn’t be surprising to see more investors look to take full advantage of the situation. It took less than a decade for drillers in the Lower 48 to do a u-turn on production and push U.S. output to record levels. 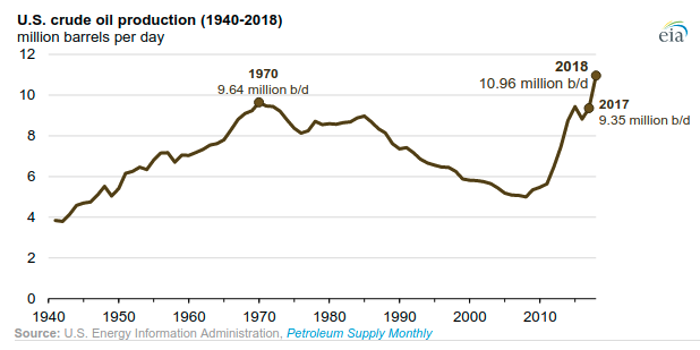 Had I told you on April 1, 2008, that oil companies would be pumping 12.1 million barrels per day, you would have laughed me out of the room... and for good cause, too. My readers know just as well as I do how dire things looked back then. Oh, what a shale boom can do, folks. But you’ve seen this chart before, haven’t you? Any investor with a dime in the oil sector has seen this production surge at one point or another. We even know where the bulk of this production growth is taking place. Texas crude production has swelled to over 5 million barrels per day recently. In fact, the EIA expects just two regions in Texas — the Eagle Ford and Permian Basin — to extract more than 5.5 million barrels of oil this month. To put a little more perspective on this amount, just consider that Saudi Arabia recently disclosed that its Ghawar oil field — which was considered the world’s largest oil field — produced an average of 3.8 million barrels per day in 2018. So that was a massive bombshell that dropped when Saudi Aramco released the news in its bond prospectus last week. Remember, the Saudis had insisted (and were believed, I should note) that the Ghawar field was pumping 5 million barrels per day for decades. Considering how much seawater Saudi Aramco needs to inject in the field to keep the oil flowing, it’s about time we officially dub it the world’s largest wishing well. That, dear reader, brings us back to the Lone Star State — now officially the largest oil producer in the world! Mark my words: Texas is quickly becoming (if it hasn’t already) the world’s new swing producer. And there’s no better opportunity than in U.S. exports. Naturally, if you’re starting your search for the right Texas operator, the best place to look is West Texas. Not only are these the companies that have a geographic advantage over the rest of the sector due to their proximity to the Gulf of Mexico, but they are also the most cost effective when it comes to extracting oil out of the ground. Last year, these Texas drillers were producing a barrel of crude between $21 and $48 per barrel. Some of the bigger fish in the pond, such as Pioneer Natural Resources, EOG Resources, and, of course, Chevron and Exxon, were pumping crude for around $26 per barrel. Here’s the dirty little secret: We don’t need $100 oil to profit from the U.S. oil export boom! Last year, Pioneer Natural Resources earned $6.31 per share, and it is expected to generate $7.10 per share this year and $9.63 per share in 2020. And it’s not alone in churning out Permian profits. Thanks to one unanimous action by Congress last year, more than $270 billion is flowing in investors’ pockets. 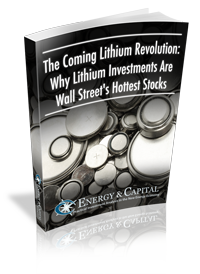 Few people were paying attention when it passed, and even fewer fully understood the enormous opportunity it created for individual investors like us. Those who did, however, are reaping the benefits and receiving regular cash payouts. Click here and find out these details for yourself.